What style cap should I order? Should my cap be lined or unlined? What type of crown should my cap have? What should my cap's left-side lettering be? What should cap's right-side lettering be? How much will my cap cost? Which Departments cannot be ordered online? Which Departments require insignias on uniform caps? 1. What style cap should I order? Past officers may only wear post caps. 2. Should my cap be lined or unlined? Lined caps feature a smooth gold nylon interior lining that provides extra comfort. 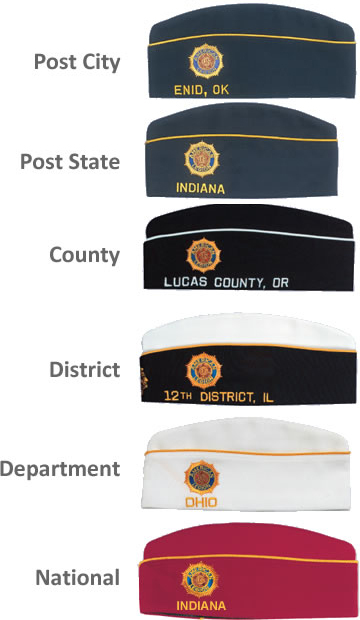 All county, district, department, and national caps, in addition to all women's caps, come with lining. Lining is optional for post caps. Only post caps can be unlined. 3. What crown styles are available? 4. What should my cap's left-side lettering be? 5. What should my cap's right-side lettering be? Your post number is embroidered on the right side of your cap at no charge. Gold lettering may be added at $1.25/letter. White or red lettering may be added at $1.75/letter by calling (888) 453-4466 to place your order. All lettering is in a straight line. Curved lettering is an additional $1.25/letter and may be added by calling (888) 453-4466 to place your order. 6. What size cap should I order? 7. How much will my cap cost? Note: Many states require caps have a state insignia. The price for that insignia is automatically added to the price of your cap. 8. Which Departments cannot be ordered online? To order Nebraska county, district, and department caps, please call (888) 453-4466 for more information. To order Ireland uniform caps, please call (888) 453-4466 for more information. 9. Which departments require insignias on uniform caps? Note: The price for the insignia is included in the uniform cap price.